Well, so it begins again; the Rogue Valley is socked in with smoke. Though the smell and sight of it is unpleasant, there are other unseen dangers lurking there as well. 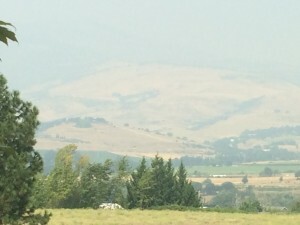 The smoke can be locally irritating to the nasal passages and lower airways, and can worsen existing respiratory illnesses such as asthma and bronchitis. The smoke contains not only carbon monoxide and carbon dioxide which can affect oxygen delivery to the tissues, but can also carry other toxic substances released by burning organic and synthetic materials. Until those firefighters get things under control, try to limit the time your pet spends outside, and especially try to avoid prolonged strenuous outdoor activities (such as ball, Frisbee, etc.). Inside the house you can keep the air clear by changing the filter for your air conditioning and running the fan to circulate and filter the air. If your pet shows signs of respiratory difficulty, including coughing, labored breathing, “cheek-puffing”, or abdominal effort during breathing, bring them in right away for Dr. Costello to have a look.